At Leading Edge Dental Center we are excited to announce the newest technology to make your experience in the dental chair more enjoyable. By using the state-of-the-art TRIOS Scanner by 3shape, we can now take 3D HD digital impressions of your mouth as well as matching the exact color of your teeth when creating a new crown, denture, or dental implant. With TRIOS, we can take impressions of your teeth without touching any part of the mouth. The TRIOS is a dental scanner that is held over areas of the mouth where scans need to be taken. Patients simply have to open their mouths! One major change you will notice right away is not having to take complete arch impressions the old way using silicone putty - a procedure known to strike fear in many patients. 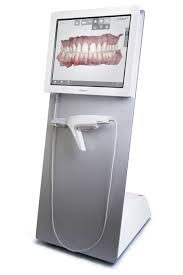 By using TRIOS scanning, no more gooey impressions and no more gagging. Taking impressions digitally is also more comfortable and in addition, the accuracy of digital impressions make the resulting restorations more precise. This cuts down on the need for remakes of the restorations due to damaged impressions caused during shipping, designing and storage at the lab. The TRIOS is used to assess different issues within the mouth, from how a patient's bite fits together to the precise shape and color of the teeth. With the scanner we are able to take precise measurement of the entire surface area of a tooth digitally and from this an exact replica of the tooth can be made. Because of this precision, an impression taken by the TRIOS is reliable and exact. Our patients are also given the unique opportunity to view a full color, high-definition image of their teeth. Dr. Goone is proud to offer this outstanding dental technology to his patients.